GIRLS from the 3rd Knaphill Guides unit went on an epic trip to the Swiss Alps, after 20 months of raising money to pay for the experience. Eleven 11 guides, a brownie, four young leaders and four adult leaders travelled by coach to the ski resort of Adelboden last month. “It was our very first international trip,” said guide Ella Wood, 13, who sent a report on the adventure to the News & Mail. “The reason we chose to go to Switzerland wasn’t just because we wanted to, but also because there is a World Guiding Centre there called Our Chalet (which got confusing when talking about the chalet we stayed in). “Our Chalet was also celebrating its 85th birthday, so that was exciting. “We stayed in a village called Adelboden which was really high in the mountains which had snow on the top. The view was amazing and our leader Helen got way too excited when she spotted the first mountain. 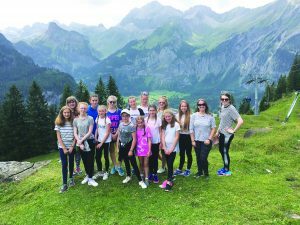 “We had a packed week full of activities, which included a visit to a chocolate show in Interlaken, zip wiring over a river, tobogganing at the top of a mountain, a visit to a woodcarver (such a long walk in the baking sun), a typical Swiss fondue and we also visited waterfalls and caves. “Half way through the week, the Guide and Scout groups staying in Adelboden travelled by cable car to the top of a mountain for a Swiss evening with lots Swiss food and music played on an alpine horn and accordions, with more entrainment done by the other Guide and Scout groups. “We saw the sun set over the mountains and could hear the cowbells echoing through the valley. “Our last activity for the week involved travelling by cable car high up to the very top of a mountain to watch traditional mountain cheese being made from scratch, which we then got to taste. The 3rd Knaphill Guides are just about to celebrate the unit’s third anniversary. Their fundraising for the trip included running lots of cake sales, raffles and quizzes and the money gained from selling their very own Chip Shop Challenge badge. Unit leader Helen Wood, Ella’s mum, explained: “Every year, we have a challenge in which we get chips from all the chip shops in Knaphill and then have a tasting session to decide the best in the village.